Our theme for 2018 is rail fence. This is a very effective design which is quick and easy to make. We’ll accept any size you’d like to donate. The finished quilt, or top, can be given to your local coordinator or handed over at the Festival of Quilts 2018. Take a look at our Pinterest board for rail fence inspiration – use up your scraps, go for simple brights, crazy patterns, and then have fun with the different rail fence layouts. For the first few days of their life babies can only see in black and white, so we are making this our theme for 2017. We’d like you to make a 30” square quilt in a geometric design, using only black and white fabrics. The finished quilt, or top, can be given to your local coordinator or, if preferred, handed over at the Festival of Quilts 2017. Take a look at our Pinterest board for inspiration, and remember that many of your favourite patterns can easily be adapted to suit a monochrome theme. Thank you so much to all those who have sent in blocks and quilts, and to those who delivered such beautiful blocks to our stand at the Festival of Quilts this August. Tickets are £1 and available from your local co-ordinator or the Project Linus stand at the British Quilt & Stitch show in Uttoxeter and Festival of Quilts at the NEC. Congratulations and thanks to all our coordinators and their supporters across the UK. With numbers still coming in we are already up to a record 28,758 quilts and blankets donated in 2015. This is over 1,000 more than last year. There were also countless premature baby hats, teddies, cushions, baby clothes, and other knitted or sewn items. Several coordinators ran fundraising efforts (raffles, coffee mornings, stands at local show, talks to WI, Rotary groups etc). We also received money from Waitrose, a few local councils, and other grant making bodies. Some of this money was used locally and some came back to the centre. With that, we bought lots of fabric for local workshops, particularly fleece and backing. We do spend a bit on admin (postage, flyers etc) and also getting our accounts audited. However, almost all our work is done by volunteers at their own expense. We have been making incubator covers for St Michaels Hospital in Bristol. This is the last of the 20 covers being delivered. 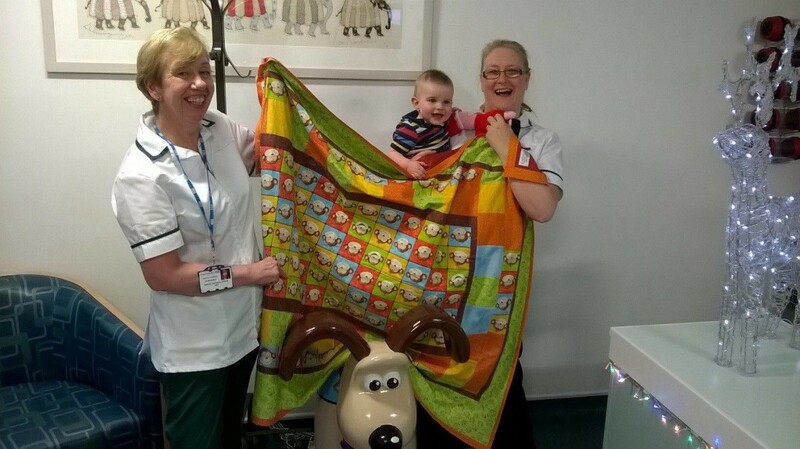 Little Patrick was born in Southmead Hospital and quickly transferred to the special baby unit at St Michaels Hospital due to various problems. He’s now a very bonny eight month old and we all got a cuddle when his Mum brought him in for a visit. Gromit always gets in on the act around here! We were asked recently for some sensory quilts with ‘feely bits’ that didn’t meet with our usual specification for no embellishments etc. We compromised with some ‘supervision only’ quilts which enabled more knobbly bits to be included. A workshop in North Nibley run by Ruth Kirkup provided many varied sensory quilts for Sense, Bristol. Some of final quilts were masterpieces, including an audio quilt made by Margaret Davie in Swindon. There are 10 animal sounds sewn into the quilt, and tabs to allow the quilt to be displayed on the wall when not in use. We’ve had a very successful year. In total we have donated 143 quilts. Some of these have been given to us by other local quilters as word of our presence is getting around! Several weeks ago we received a message from one of the other London coordinators about a young lady with a lot of fabric for us. Travelling by train and bus (and not sure what ‘a lot’ might be) Margaret took a not-too-big wheelie suitcase and a bag which ended up being stuffed to overflowing. Unpacking for the ladies in our group was like being in fabric heaven – we were all planning in our heads what we would be making and we won’t be shopping for a while! Daryl recently gave a talk to the members of the Emmanuel Quilters in Dartford. it went well despite the lack of heating and we were set home with 19 quilts and the proceeds of their entry charge, sale of goods, and raffle. Lately we’ve been experimenting with preprinted panels. Kim contacted an eBay seller to see if we could get some more and mentioned what we’re doing. The outcome was that they are putting another panel in for free and are going to look into sending any scraps that we can use. They are very willing to help as they said it’s nice to know that we’re out there volunteering to try to make children’s lives more comfortable. The most moving request we’ve had was for a quilt for a stillborn baby. The mother was going to order one from the US but heard about our group so were able to get one to her within a few days. We also made a tiny matching square for the mother to keep with her. We used to keep an album of photos of our quilts but Chris has now set up a Pinterest board to act as online storage. Our New Year’s resolution is to finish off some UFOs we have sitting in the cupboard – with all the donation of fabric and unfinished patchwork pieces we need to make some space! A while back the local branch of MIND contacted me. Their therapeutic craft group has made quilts for Alzheimers and had heard about Project Linus and wanted me to visit. Their work was good; they had had a good tutor. One problem – our council had slashed their craft budget severely – however I was able to let them have fabric, fleece, and wadding from donations made to me. I didn’t hear from them for a while as their tutor had moved, but this month they presented me with six lovely quilts. 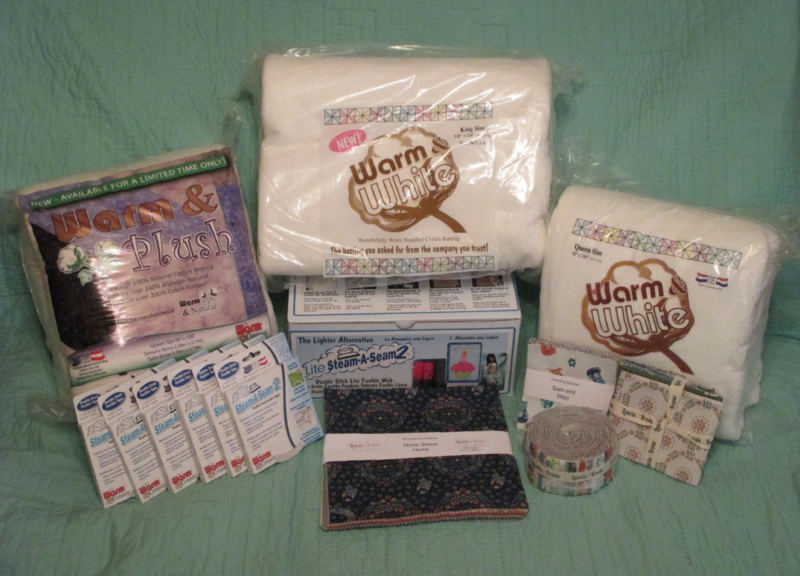 I feel this is a real circle of care, donations to our group being put to good use, the ladies making quilts benefit and the quilts are produced for various outlets. Please send any articles or photographs for inclusion in the next newsletter to Ann. Thank you so much to everyone who came over to say hello during the Festival. It was wonderful to meet so many of you, and we received a fantastic number of seaside quilt blocks along with many completed quilts and blankets. Don’t worry if you haven’t got round to making any challenge blocks yet, just send your completed blocks to the address below or pass them to your local coordinator – there’s no deadline! The theme for 2016 is “Seaside“. There are two simple patterns available (a beach hut and a sailing boat) but let your imaginations run wild. The only constraints are that all blocks need to be 12.5 inches unfinished. Download our PDF containing two simple patterns (To view PDFs you’ll need to install a free copy of Adobe Reader). For more patterns and inspiration take a look at our seaside inspired Pinterest board. The early summer is a relatively quiet time for me. The year starts with the Linus annual accounts. March is the Guild stand at Olympia where we show beginners how to make a simple block and how it gets turned into a Linus quilt. April is the Guild AGM and the Linus stand at Uttoxeter. Now I can actually do some sewing. The current project is to make 18 larger quilts to go on the bunks at an adventure camp for inner city kids who would not otherwise get a holiday. I am privileged to live in the beautiful South Shropshire hills at the bottom of the Long Mynd. This is prime country for schools in the West Midlands and Birmingham to send pupils to do their Duke of Edinburgh awards. Pontesbuy Deanery, based near us, has been organising these holidays for many years and I was delighted to get involved because I know from my own children how important it is for City children to be able to run around in open country. Now that I have the Lucey long arm quilter, donated by APQS, it is really easy to make a top into a quilt. I made two tops, each approx 42inches square. The Warm company have donated quite a few rolls of wadding 90″ so I put both tops on one piece of wadding with a length of 60″ lightweight cotton for the backing. It took less than one hour to do the quilting on the two tops using a random meandering pattern. This is worked from the needle side of the machine so you can see what you are doing which makes it much easier than trying to follow a pantograph. How many of you took part in ‘Knit in Public’ day? We had a little group knitting in our local library and chatting – libraries have changed since my youth. It was just as well that we met indoors as it rained all day. It’s good to show people what we do. Apparently the NHS is even considering prescribing knitting as therapy for depression and dementia. How boring life would be if we didn’t keep making things. Hilary Jackson and Sarah Humphreys are a Mum and Daughter team who have recently started to organise quilting retreats in Kegworth, Derbyshire. The first retreat, in October 2014, proved so popular that in May of this year they held two retreats – attended by a total of 52 ladies from all over the country. Hilary and Sarah have been supporters of Project Linus UK for many years, having made and donated several quilts through their local quilt groups. 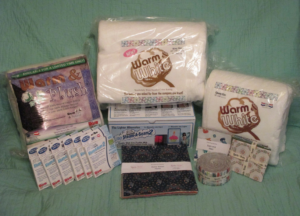 They were sure that many of the quilters attending the retreat would love to support Project Linus as well so set a little ‘preretreat challenge’. 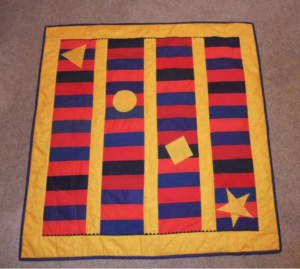 They circulated the instructions for a simple 10” quilt block and asked each quilter to make one block in bright colours, suitable for a child, and bring it with them to the retreat. The response to the challenge was fantastic. In all, 160 blocks were donated – enough for ten quilts. During the retreat weekend, Sarah and Hilary sorted and stitched the blocks. Hilary then took them away to quilt and bind. Everyone was delighted with how the quilts turned out and commented on how – with the same instructions – quilters can end up making such diverse blocks. It is amazing though that the blocks still go together so easily to make a wide range of quilts which will hopefully appeal to children of different ages. These quilts have now been given to Home Start in Sheffield for the families to enjoy A big thank you from Sarah and Hilary to everyone who donated a block. They’ll certainly have another challenge ready for quilters at the next retreat! We had a very productive day’s workshop at Caithness Quilters and made enough blocks for about 5 quilts. This idea came about as some of the ladies had heard that they could make a foundation pieced house block for the Festival of Quilts in Birmingham in August which would go to make Linus Quilts. I have been asked to provide 20 incubator covers – quite a task! The first of these have now been delivered to SCBU at St Michaels Hospital Bristol. The only stipulation was that they should have dark backs to minimise the light. Apparently the babies are then able to open their eyes without the glare of the lights and the mothers say that bonding begins properly at this point. I have been able to use up ‘ugly’ on the back and also light damaged dark fabrics so it is proving quite useful. Only the centre is quilted – 40 x 20 – which I do free motion quilting to ensure it can’t come adrift anywhere. When folded back it folds exactly on the wadding line so stays put. “Our son has just recently come out of the Sick Kids hospital. The day we were leaving we were giving a beautiful blue/cream teddy bear and balloons patchwork quilt which is now keeping our 1 year old very cosy. Thanks so much for giving us such a lovely gift. It put a smile on our faces after having such a worrying time in hospital with our son. We really appreciate it and it will take pride and place in our son’s bedroom”. Every year at the Festival of Quilts we set a challenge. How many blocks can our visitors make on a given theme? These blocks are then made into packs to give to our volunteers across the UK who make them into quilts for sick, disabled or disadvantaged children to provide cheer and comfort. Our theme this year is Homes and Gardens. Houses, trees, flowers, gardens, beach huts, anything you’d like. Any style of patchwork or just squares of fabric. Blocks should be 12 1/2″ square and unquilted ready to be pieced together. Download our PDF containing a simple house block (To view PDFs you’ll need to install a free copy of Adobe Reader). For more patterns and inspiration take a look at our latest Pinterest board. FoQ Blocks, 18 Alison Road, Church Stretton, Shropshire SY6 7AT. Do you shop online? If so, you could be raising funds for Project Linus with many of your purchases. By registering for the free Easy Fundraising website and selecting Project Linus as your nominated charity, each time you shop online with any of the 2,000 Easy Fundraising retailers (including Amazon, John Lewis and M&S) a small donation will be made to the charity. It doesn’t cost you (or the charity) a single penny. While the amounts are only small, they quickly add up and help us to create more blankets and quilts for young people and vulnerable adults in the UK. Your donations keep the charity going and contribute towards buying fabric, wadding and other sewing and quilting supplies. Exotic animals and birds, foliage and flowers or characters from cartoons. Any style of patchwork or just squares of fabric. Blocks should be 8 1/2″ square and unquilted ready to be pieced together.